Ever imagined a beach without the beautiful palm tree? .. .. the air that we breathe and that surrounds us is full of millions of interesting compounds. Some of these compounds can be harmful to our health and some of them can affect things like weather and climate,” explains an atmospheric chemist at the University of Cambridge. The Arecaceae are a botanical family of perennial climbers, shrubs, acaules and trees commonly known as palm trees (owing to historical usage, the family is alternatively called Palmae. On the same purappadu on Thirukarthigai day (3rd Dec 2017) have made a post on Thirukarthigai purappadu and on ‘chokkapanai’ where dried leaves of palm are burnt .. .. ! River Cauvery is considered most sacred ~ in the words of Thondaradipodi Azhwar – ‘more sacred than the Sacred Ganges’…. ~ and in that beautiful island formed by Cauvery [Kaveri and Kollidam] reclines Lord Ranganathar at Thiruvarangam. Azhwars, many sages and saints have left a rich treasure for posterity, in the form of classics containing all information about God and how He is ready to respond to the devotees' sincere pleas. ஆபாதசூடம் ~ from the feet to the crown, perhaps was his resolve when he started singing, but he cannot take his eyes off the Thiruvadi. Such was his bakthi of Sri Thirup Paanazhwar whose thirunakshathiram “ Rohini in Karthigai month” – that we are celebrated on 3rd Dec 2017. In thondai mandalam, the moolavar will be anointed with ennai kappu from Thiru karthigai day and there will not be purappadu after. Hence generally, there will not be sathrumurai purappadu for Thiru Panazhwar. 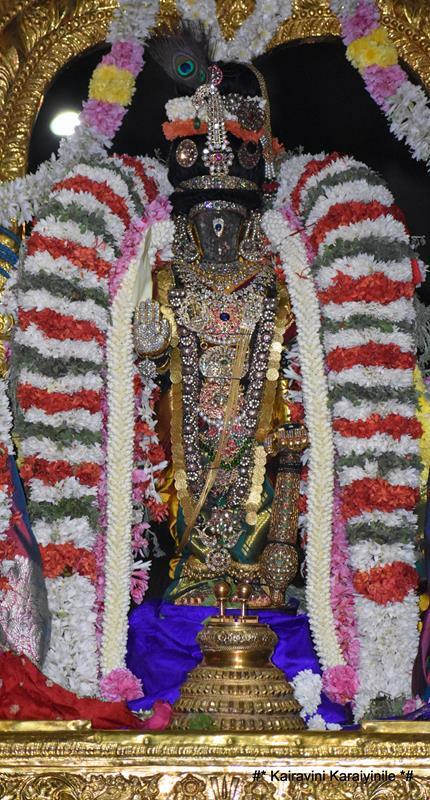 This year, Karthikai is celebrated on this day and there was grand Purappadu of “Panar” with Sri Parthasarathi perumal. The Azhwar, an amsam - Sri Vatsa of Sriman Narayana was born at Uraiyur and brought up by Panars who sung mellifluous paeans in praise of Lord. Such was his blemishless devotion to Lord Aranganathar that he claimed that he does not want to see anything else with his eyes that saw the most benevolent Lord Arangar. ~ அண்டர் கோன் அணியரங்கன் என்னமுதினைக் கண்ட கண்கள்; மற்றொன்றினைக் காணாவே. Thirupanalwar used to come to the banks of Cauvery, deeply imbued in bakthi he would sing with deep anubhavam about the kalyana gunams of the Lord every morning. In the divine Naalayira Divya prabandham, his contribution is Amalanadhipiraan – just ten verses in number. His prabhandham is different from the rest in a way that it does not contain any upadesams or anything else but only hymns in praise of Lord Ranganatha alone. Those well versed in sampradhaya state that these are aanandha-lahari (limitless outpourings of the bliss of aanandham) at the anubhavam of the Soundharyam of Arangar. Thirupaan azhwar. Azhwar totally immersed with bakthi, refers to the Lord as Vimalan, glorifying His blemishlessness and magnanimity. The immaculate Lord Ranganatha [Arangathamman] cleanses the massive dirt of ignorance of the worshippers and imparts purity to them. Indeed He is the purest of the pure and the most auspicious among the auspicious. The Lord “Nimalan” is the one who bestows boons on his devotees even unasked and unsolicited, enhancing His greatness still further. And when someone thinks of such magnanimous Lord – the Lotus feet – the very thought gets ingrained in the eyes of Azhwar who could see nothing else and melts with the benevolence of Lord Ranganatha. Here are some photos of Thirupanazhwar with Sri Parthasarathi taken during the purappadu – also some photos of the ‘chokkapanai’ being lit for the Karthigai deepam. It is the day for us to fall at the glorious Lotus feet of Sriman Narayana, get rid of our sins and concentrate on doing kainkaryam to the Lord and his devotees. கார்த்திகையில் ரோஹிணி நாள் – திருப்பாணன் பொற்பதங்கள் செகதலத்தில் வாழியே.